i like the sanimus fig’s head, but it seems to bulky. zero suits good but i would use a different head. To pick a nit, Zero Suit Samus is playable in Metroid: Zero Mission (for the GBA) and Super Smash Brothers Melee. I haven’t quite finished Metroid Prime 3 yet, but as far as I know, you don’t play as Samus in the Zero Suit in that. Whoops, I meant to say Super Smash Brothers Brawl! Also, I like the way the head is constructed. 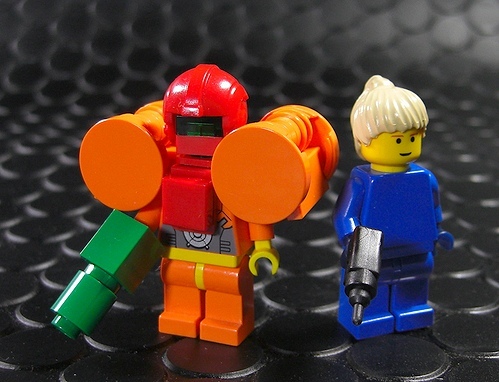 The shoulders are too bulky, sure, but this is the best minifig Samus attempt I’ve seen yet. She’s not easy. Maybe use 80’s- or 90’s-era space helmets for the shoulders and only one brick for the arm-cannon. There are a lot of patterns on the varia, too. The Zero-Mission suit looks fine to me, though I’d get a different face. It would be cool to do the old-school suit, too (the yellow one without the ball-shoulders). ^ The LEGO creations we feature on The Brothers Brick are most often built by people who are not directly involved in the site. Even if Moko were to see your comment, most LEGO builders do not sell their creations. Sorry! Contributors to this blog did not build this minifig, and in general the items featured here are not for sale. Also, to protect your privacy and online safety, I’m removing your e-mail address from your last comment.